A razor-thin margin of just 0.08% of roughly 128 million votes cast, less than 1/10 of 1% of the overall electorate representing 100,000 more votes that Trump received in the three swing states of Pennsylvania, Michigan, and Wisconsin, have allowed him to become the most powerful man in the world. With a clear mandate he claims, about as clear as a mud hole I’d say. Because he received almost 3.5 million fewer votes than Hillary Clinton, his margin of victory in the popular vote is actually about -2.1%, yes that percentage is in the negative column.The fact that more Americans wanted Hillary Clinton to be President than Donald Trump is irrelevant we are told. Trump received the majority of votes in 3o states compared to Hillary’s 20. Huge areas of the map are shown in red, and even in states Hillary won, red predominates, with urban enclaves predominately blue. 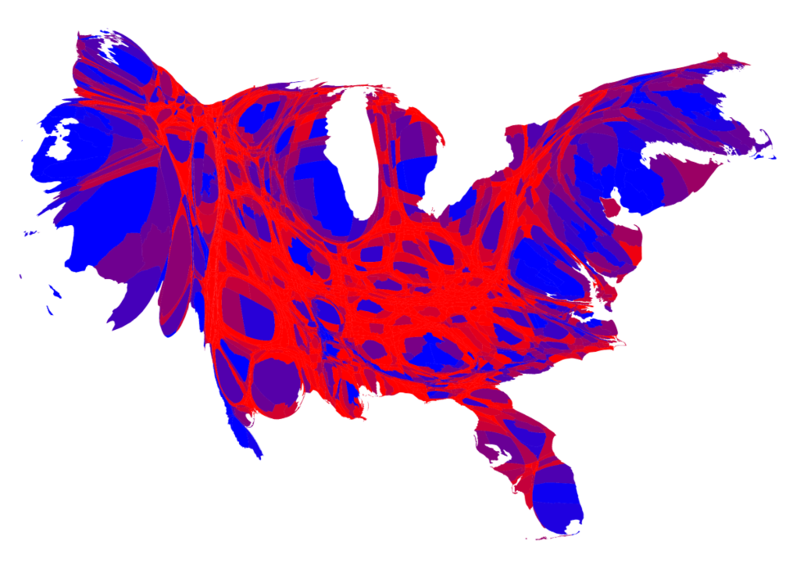 It was certainly a landslide in geographical terms, he won about 80% of all counties in the U.S., but take away the vastness of Alaska and the huge chunk of the middle of the country that spans the sparsely populated Great Plains and suddenly the map looks much more evenly divided between red and blue. Trumps vote total in the combined states of Oklahoma, Kansas, Nebraska, South & North Dakota, Montana, Wyoming, and Idaho was @3.4 million. A figure easily matched by Hillary’s margin of victory in California alone, where she garnered 7.3 million votes overall and, you guessed it, received 3.4 million more votes than Trump. But its all water under the bridge. We elect our Presidents by whoever wins enough states to get to the magic number of 270 electoral votes. After that, it doesn’t matter how many millions of people voted for the loosing candidate. It begs the question, whats more important, geography or human beings? Obama campaigning for Senator on the streets of the South Side of Chicago, 1996. Obama won in 2012 with 332 electoral votes, and by over 2 million popular votes, and yet unlike Trump or George Bush Jr. I dont recall him bragging afterwards nor claiming a historic landslide, nor making any derogatory comments about those who opposed him. But no matter, like George Bush in 2004 who narrowly beat John Kerry by about 2% in the electoral college and in popular votes, and arrogantly boasted the following day after the election was over, that “Ive earned political capital, and I intend to spend it.”, so it is that Trump and his allies and rank and file supporters are hailing his election as a great triumph of the common will, a “historic landslide”. Implying of course that the vast majority of Americans are behind him. Well, 63 million Americans are indeed behind him, but around 66 million, including myself, certainly aren’t, and another 80 or 90 million Americans either because of apathy or disgust over two very poor choices, are hard to decipher since they decided not to vote at all. Let me be clear, no question Trump won this election decisively by the terms and conditions of our winner-take-all electoral college system of voting for President. Contrary to conservative voices who say “most people who are opposed to the Electoral College don’t understand it”, I do understand it thank you. And that’s why I believe we should abolish it or only invoke it when the popular vote count is at or less than 1%, otherwise, millions of voters continue to be disenfranchised. Hillary destroyed Trump in California, winning by over 3 million votes, but she only needed to win California by 1 vote. Trump destroyed Hillary in Texas, winning by 800,000 votes, but he only needed to win Texas by 1 vote. I’d hate to be a Trump supporter in Hollywood or Washington, D.C., or a Hillary supporter in the Texas Panhandle or coalfields of West Virginia. Going to the polls for those folks was an exercise in futility. Surely a significant percentage of the 80 million no-shows were like the examples I cite above, why vote if you know for a fact that your state is going to go with the opposite party or candidate anyway? I believe the President should be elected by majority popular vote, then and only then can we honestly say that every single vote really counts. My guess is that voter turnout would hit all time highs, well beyond the truly embarrassing 50-60% range that has characterized most of our elections. In the event of the popular vote being closer than 1%, perhaps there could be allowance made to suspend the decision 4 weeks lets say, after which time, with 99.9% of the vote in, its still at or close to 1%, the candidate with the most electoral votes wins. There is no need to attempt a nationwide recount. In such case, Hillary would now be the President-elect, Richard Nixon would’ve still won in 1968, and JFK would’ve still been declared the winner in 1960. So it cuts both ways, as it should. And dont believe it when they tell you how the electoral college gives rural America and smaller states a voice they wouldn’t normally have. With direct popular vote, those areas would have more incentive than ever to get out the vote. Further, the argument we hear that, without the Electoral College, candidates would focus only on high-density urban areas is truly a con-job. Over 2/3 of the campaign rallies held by Trump and Hillary took place in just 11 states. And its been the same pattern in every Presidential election. Candidates’ resources are never spread evenly across this beautiful land from sea to shining sea, but rather they are concentrated each and every time on those crucial swing states which will deliver the necessary electoral votes to give them the majority in the electoral college. Folks can invoke lofty phrases like “constitutional republic”, but I prefer to call it as I see it; the so-called tyranny of the majority has, for the 5th time in America’s history, been replaced by the tyranny of the minority. 2016 election results by county. 0.08% ain’t no mandate and certainly no landslide. Yes, Trump won, not by running on the issues so much as running on vicious personal attacks , hate, divisiveness, and race-baiting, rather race demonizing, for his was perhaps, no, strike that, WAS the dirtiest campaign in all American history, bar none. Let’s face it, he unabashedly pulled out all the stops. If George Bush Senior in 1992 had played ball like this against Governor Bill Clinton (who even then was dogged by his track-record of infidelity) he would’ve easily served a second term as President. But George Bush Senior ran a clean campaign, stuck to the issues, and…..lost.So Trump has barely squeaked by with a narrow victory thanks to 107,000 voters in three key states that just barely tipped the balance in his favor. Churchill nailed it, “Never have so many, owed so much, to so few.” America has certainly put a nightmarish twist on that once noble statement. Posted in UncategorizedTagged 2016 presidential election, blue states, electoral college system, hilllary defeat, red states, trump tweets, trump victory, usa presidential election'Bookmark the permalink.